Each incorporates fruits and makes them practically irresistible to me. Now if only I can invent a fruit dish and call it a “Whoopsy” I think my life would be complete!! So naturally I was all smiles and sunshine when it came time to make this weeks TWD recipe. 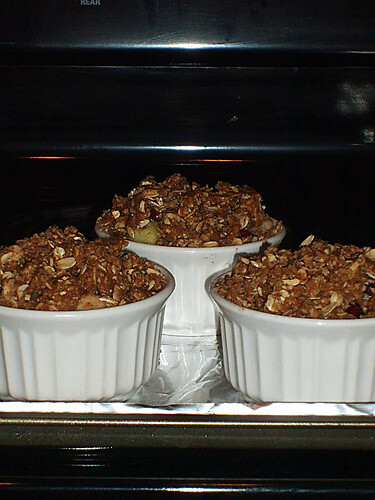 I didn’t change much about the recipe: I doubled the cinnamon and subbed the ginger for nutmeg, added some cinnamon to the cran-apple filling, and added chopped almonds to the crumble topping. And boy, let me tell you… this was GOOD!! I don’t think I have ever fully appreciated the cranberry in anything except juice UNTIL NOW! I’m a changed woman. Changed I say. 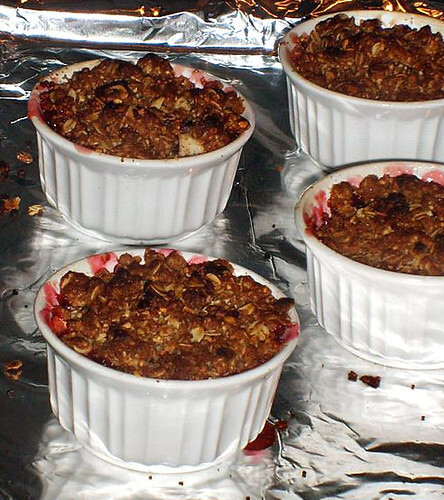 Their tart tanginess dances beautifully with the sweet apples and crunchy-nutty-aromatic crumble topping. You KNOW you want the recipe, so head on over to Em at The Repressed Pastry Chef and take a gander at her delish goodies. A “whoopsy”? That shouldn’t be too hard. Your crisps look good. Wish I could taste your version. Sounds interesting. Tempting photos. I wish I had some more of these. AT least it’s an easy recipe, right? Looks great. I took it in a whole different direction. Your crisps look great! I’m glad you enjoyed it. Your crisp look so good! 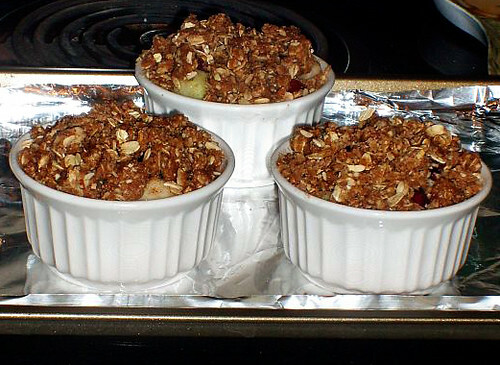 I like the idea of adding almonds into the topping. I’ve never had a fool, grunt, or slump before.. I actually don’t know what they are so I’ll have to check it out. You’re right, this would be so good with icecream. Lucky you! I can’t preorder my New Moon ticket. The first showing isn’t even until 10pm on the 20th, which means it will be madness at the theatres. I’m debating on waiting a week, but I don’t think I can handle it..haha. I loved the cranberries in this crisp, too! I love almonds, so I think your version of the crisp is perfect. They look delicious, I may have to make this again soon! It looks so good and hot sitting on that oven! I love your topping it looks so wonderful and tasty! Im really looking fwd to making this one. I have heard nothing but good all day. I made the bundt cake this week and liked it. I think I will like the crisp better just cus I love crisps! I will remember to grab some vanilla icecream! ice cream would have been perfect with these but I didn’t have any either! Your crisps look great, adding almonds and extra spices is always an excellent idea in my opinion. Funny names make the desserts even better, don’t they? I was pleasantly surprised at the cranberry and apple combination, too. And you’re right about the ice cream! A whoopsy!! We will have to work on that one. Crisp looks perfect. I added walnuts to some and white chocolate to some. These were really good. hmmm… what abt whoopie pies… that’s kinda close to a ‘whoopsie” lol.